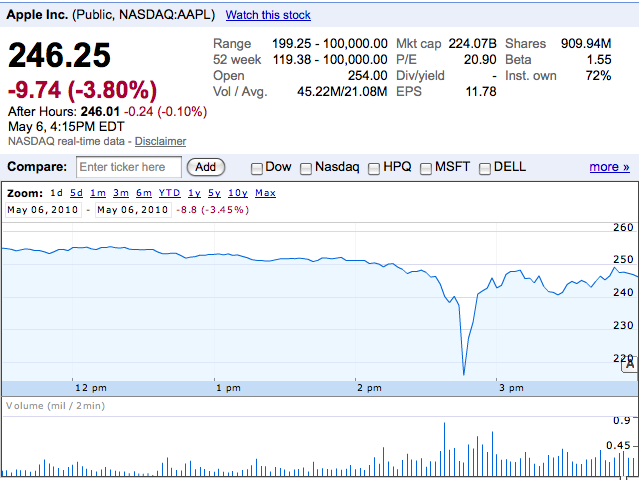 The US Stock market today had a bit of a wild ride and AAPL certainly didn’t escape its effects. AAPL briefly traded as low as 199.25 before rocketing back up to 246, still nearly 10 points off the opening. According to CNBC, the selloff was triggered when a Citigroup trader entered a ‘b’ instead of an ‘m’ in selling off Proctor & Gamble shares (see video below). Can this really happen? Breaking news for iPhone, iPad, and iPod. Be the first to know about product launches, iOS updates, product carriers reports, and competitor analysis. Publisher and Editorial Director of the 9to5/Electrek sites. Video: Which iPad is best for you?